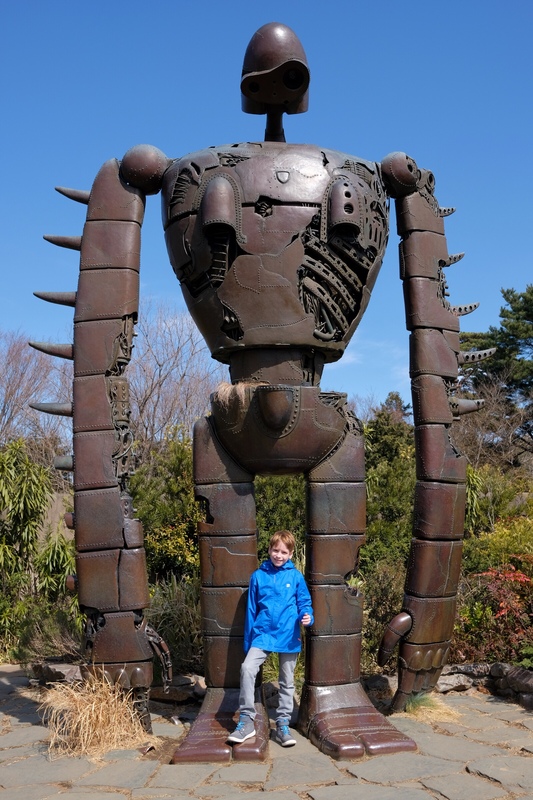 On day two of our trip to Japan, we took the subway out to Mitaka, to visit the Studio Ghibli Museum. The subway took about 50 minutes, then we walked about 20 minutes through a gorgeous park, before spotting the entrance to the quirky museum at the far end. The first floor has a small room filled with movie stills and an intricate contraption that spins several round platforms behind a cylindrical glass, each with a different set of characters from the films, with lights flashing on and off, making it look like the figures are moving. We watched it wind up and go heaps of times and never got tired of it. The second floor has two exhibits, one with drawings and storyboards from the films; the other has drawings and stills of food from the films. Each of these exhibits were wonderful and had us reminiscing about our favourite bits from the movies and our favourite characters. Rowan hanging out in the Castle in the Sky. 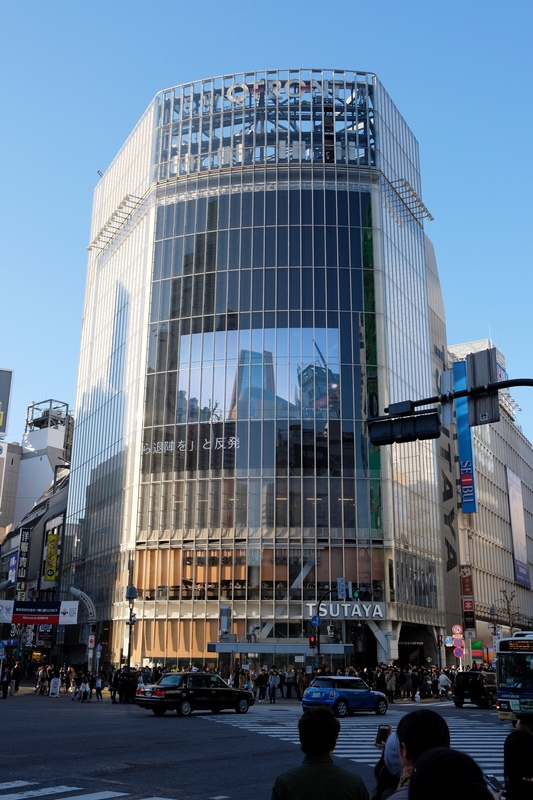 The third floor houses the gift shop and a circular staircase out to the rooftop terrace, that has gardens and a statue of the robot from Castle in the Sky. It was also a favourite, especially since it was such a warm and sunny day and the plants are so lovely and the space so whimsical. We also got to watch a short film that is one of seven shorts you can only see at the museum, in Japanese, with no subtitles. We loved it! It was an incredibly charming and endearing story about an elderly couple in rural Japan and a team of sumo wrestling mice (! ), and we were so happy we had the opportunity to see it. 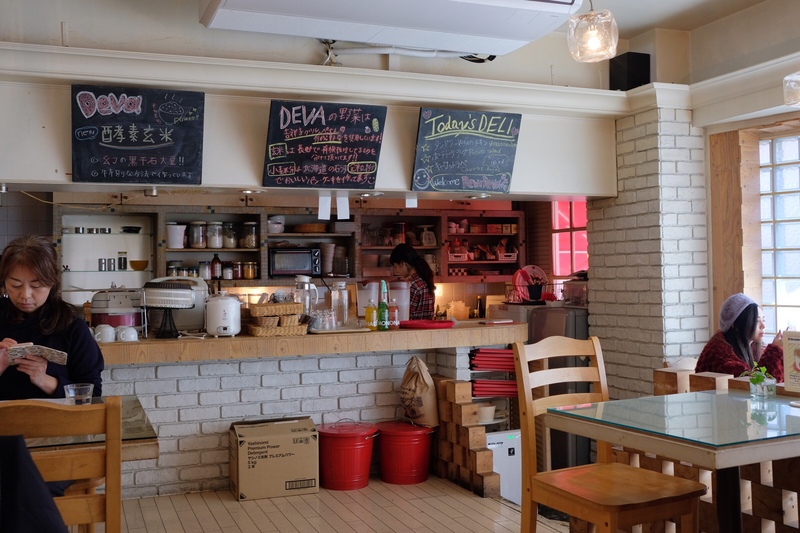 Afterward, we went for lunch at a vegan restaurant called Devadeva Cafe, where I had a mind blowing bean curry and rice, with the mildest, most beautiful tea I’ve ever experienced. Kevin had a teriyaki mock chicken burger which he loved and Rowan enjoyed a fabulous passion fruit juice, mock chicken nuggets and potato wedges. Getting ready to cross the Shibuya Crossing. The food sounds amazing, you’re fortunate to find such good vegan restaurants. The movie you saw sounds wonderful, I just love the simple charm that Japanese films have. When you get back, you should download Kanopy, it’s the Toronto Public Library’s streaming software that you can use free of charge (8 movies per month) with a valid library card. The movie I recommend is This Beautiful Fantastic, a charming story of a young woman with moderate ADD and her grumpy old neighbour. Michela, your photos are beautiful. The statue reminds me of The Iron Giant, one of my all-time favourite movies. I’m really enjoying your blog. Sincerely, Leah Gryfe (a colleague of Kevin’s from HSH). Thanks, Leah! The photos are all Kevin – he takes thousands of them when we’re on vacation. The iron giant is a great film, and it does look a lot like the Ghibli giant!